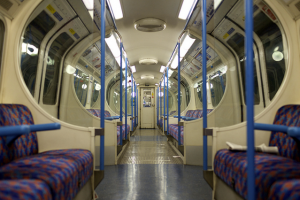 TfL has launched an investigation after a set of doors at the rear of a Victoria line train apparently opened while it was travelling between stations. The incident, news of which the BBC's Tom Edwards broke this morning, happened last night when the train was pulling to a stop at a red signal whilst heading south into Brixton station. The train in question was one of the older vehicles, and not the recently-introduced new stock (which has had teething troubles of its own). The doors were closed immediately, and according to TfL, it was the result of driver error (though we've little doubt that Bob Crow will spin it into being the fault of Tube cutbacks). Nobody was injured, but it doesn't take much imagination to see what would happen if the doors of a speeding train were opened during rush hour. It's also surprising that the train doesn't appear to have been fitted with a device to prevent the doors opening while in motion; perhaps a more technically adroit reader can let us know what (if any) safety measures are in place.